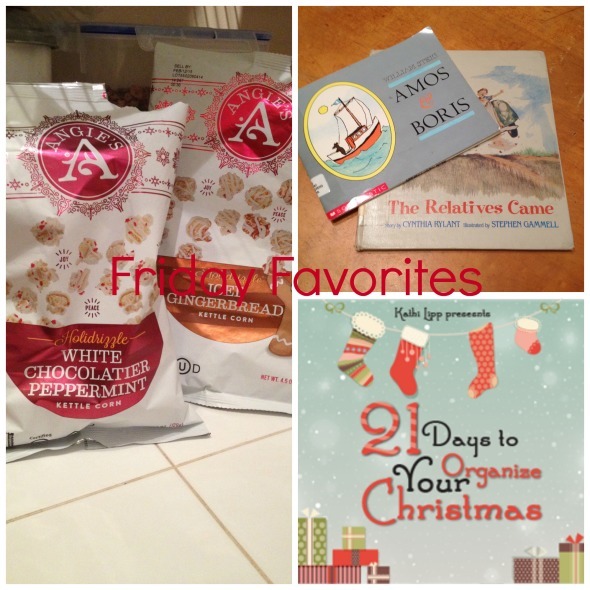 Here are a few of my favorite things from the past week. These podcasts, blog posts, snacks and books provided enjoyable moments during the chaotic days that usually ensue when you have two children under two. A Christmas that is peaceful, connected and meaningful from So Here’s the Thing with Kathi Lipp. Yeah, so who doesn’t want to have a Christmas that is peaceful, connected and meaningful? Unfortunately for many people, Christmas is anything but that. Instead it is filled with stress, debt and overbooked schedules. I loved this discussion between Kathi Lipp and Erin MacPherson about keeping some realistic expectations and meaning during the Christmas season. My Top 10 Favorite Books of All Time – This Is Your Life with Michael Hyatt. As if I didn’t have enough books on my reading list already. Michael Hyatt discusses his favorite books of all time. I always love to hear what other people, especially leaders, are reading. Praying for your Child – Tricia Goyer, contributor for For the Family blog, writes about praying scripture over your children. She breaks Philippians 1:9-11 into seven categories, and suggests praying for one each day of the week. Practical help for parent’s prayer life. So Angie’s popcorn is probably my new favorite snack. I was introduced to the brand when the contributors of Small Fry blog raved about it. When I came across it at our local Natural Foods Co-op, I knew I had to give it a try. It’s still a sugary snack, but maybe with a little less guilt since they use non-GMO corn (if that’s important to you) and don’t use High Fructose Corn Syrup. They even use beet powder for coloring instead of artificial colors. These holiday flavors – White Chocolatier Peppermint and Iced Gingerbread – oh my, are so good! I have come across some really good reading lists that focus on quality, well-written books for children. I recently checked out two recommendations from the library. Amos and Boris by William Steig and The Relatives Came by Cynthia Rylant. These books are great! Even though I’ve read these several times this week, I still enjoy them. The vocabulary and writing are excellent. Amos and Boris is a good bit longer than most of the books I read to my daughter, but to my pleasant surprise, she remained engaged in the story during the several times I’ve read it. I can’t wait to check out the other recommendations. That wraps up my list of favorite things for this week. I’d love to hear what keeps you going during the week! Thanks for sharing about the podcast – so glad you enjoyed it! Thanks Kathi for taking time to comment! It made my day! Love your podcast and hearing you speak on Focus on the Family radio. Thanks for all you do to encourage women and mothers!